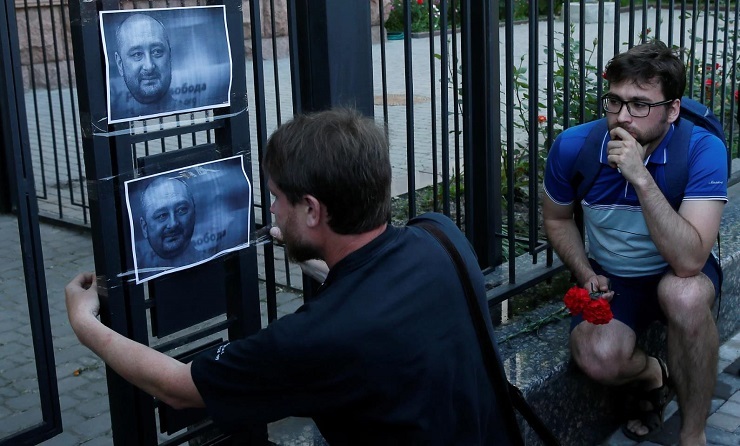 Ukraine’s Prime Minister Volodymyr Groysman has accused Russia of being behind the killing in Kiev of the Russian journalist Arkady Babchenko. “I am confident that the Russian totalitarian machine did not forgive him his honesty and principled stance,” the prime minister posted on Facebook. Yet shortly after the announcement of Babchenko’s death and as accusations began to mount against Russia – the Ukrainian government announced that his death was staged by Ukrainian security services. Ukraine’s government now claims that the staged murder was in response to an allegedly “genuine” threat to Babchenko’s life. Details of the precise threat to Babchenko’s life were murky. Vasyl Hrytsak, the head of the SBU, said Russia’s spy agencies had contacted a middleman, identified only as G, and paid him $40,000 to arrange the murder. The middleman in turn approached a former Ukrainian volunteer soldier to carry out the hit, together with additional “terrorist acts”, he said. However, the Ukrainian government’s claims regarding the alleged threat to Babchenko’s life and the necessity of deceiving to the entire international community are of course predicated entirely on the credibility of Kiev – of which it now has none. Despite Kiev’s current crisis of credibility – many members of the Western media still busy editing and deleting humiliating jumps to conclusions – find themselves immediately and unquestioningly accepting the Ukrainian government’s explanation – a government who just lied to them about Babchenko’s murder in the first place. Like a deep sea diver whose air tanks have run out – some have sensibly rushed to the surface – denouncing Ukraine’s antics as deceitful, dangerous, and self-defeating. Others – however – are inexplicably diving deeper in the belief that an alternative source of air exists somewhere in the abyss of lies below now being constructed to defend Kiev’s actions and the Western media’s reaction to them. Babchenko was not dead. His murder had been staged in order to catch a contract killer who had been paid $40,000 to assassinate him and who was planning to kill others. Babchenko walked into the room. People cheered. The security services gloated: They had, they said, used the fake murder to catch the middleman who paid the would-be assassin. Plus, of course, they had finally made the Russians look stupid and themselves look smart. What “chaos”? Who’s a “failure” now? They had convinced the world that Babchenko was dead, pulled off a surprise, caught a criminal. Because the security services are under direct control of the Ukrainian president, they may well have helped him in his coming election campaign, and that may well have been part of the point. Applebaum never fully explains how the Ukrainian operation made “Russians look stupid.”Over the years following a US-organized putsch to seize power in Kiev, Russia has consistently maintained that the Ukrainian government is deceitful, untrustworthy, and illegitimate in the way it seized and now maintains power in Ukraine. Until now, most Western governments have officially avoided the public trolling and open trickery that the Russians use on a regular basis. Instead of producing disinformation to counter disinformation, most mainstream Western journalists have doubled down on facts, believing that in an increasingly unstable world, they should stick as far as possible to the truth. 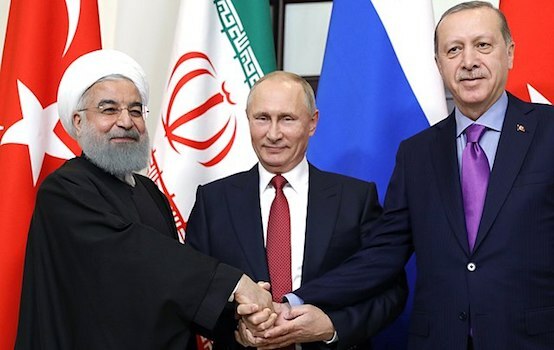 Yet the entire exercise Applebaum claimed on social media, “outplayed Putin at his own game,” proved definitively that Western “journalists” are entirely indifferent to facts. Even as it was revealed that the murder was staged and that Kiev was guilty of deceiving the international community – “journalists” like Applebaum continue to remain indifferent. And as members of the Western media like Applebaum dive deeper in into the abyss of lies and the same pattern of unprofessional conduct that teed most of the Western media up for this unprecedented humiliation in the first place – this final point regarding the Western media’s lack of credibility is driven home even further. The full story regarding the Babchenko hoax is still unfolding. Had the hoax not been revealed, and Babchenko hidden away – it is likely the same scenarios that unfolded after the downing of MH17 and following the more recent Skripal affair would have been repeated once again.There would have been sustained accusations and condemnation of Russia – the implementation of further sanctions, the further justification of NATO expansion along Russia’s borders, and further pressure placed upon Russian positions in Syria. The unraveling of the Babchenko hoax so far remains unexplained. Kiev’s explanation is both implausible and lacks any credibility considering Kiev just intentionally lied to the international community. Was it a botched, staged provocation? Or something else? The United States and its NATO allies find themselves relying upon the lowest common denominator within any targeted nation. 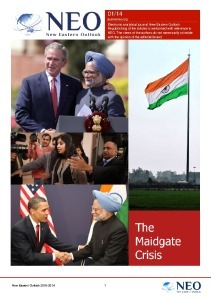 The US and NATO itself have suffered for years from a crisis of credibility. Those willing to work for a discredited and unsustainable geopolitical project like NATO would only do so because they lacked sound judgement and other human qualities associated with responsible leadership. Many in the Western media reeling from Babchenko’s “return from the dead” have noted themselves that Kiev already suffers from a lack of public trust because of its serial incompetence, deceit, and corruption. Kiev is just one of many unreliable allies scattered across the multiple conflicts and crises NATO presides over. Many of these allies have proven themselves to be more of a liability than an asset to NATO and its global agenda.Because of this, those faithfully working within the system NATO represents – like Anne Applebaum of the Washington Post – find themselves cleaning up after messes like the one recently made by Kiev. Were the Babchenko hoax just a “sting operation” as Ukraine and many in the Western media are trying to claim it was, was it really necessary for the Ukrainian prime minister himself to comment on what he knew was a staged “murder,” and even accuse Russia at the cost of his credibility? This seems unlikely. Did Kiev take it upon itself to unilaterally carry out their own rendition of the UK’s Skripal affair – with its NATO minders distrusting their ability to see it through and forcing them to humiliatingly end the operation by publicly announcing Babchenko’s murder as a hoax? This seems much more likely. Time will answer these questions in full.